One of my minicourse subscribers recently sent in an email asking about waterproofing, asking what works and what doesn’t, what to look for and what areas to be careful with. 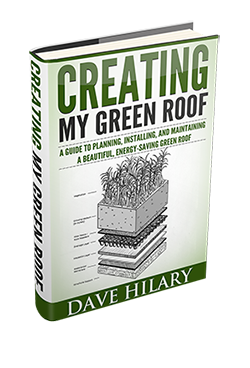 An entire book could be written about waterproofing green roofs and you could get into the topic so deeply you’d become an expert on just that one aspect of green roofs. For most people who are going to do their own waterproofing a basic understanding of the structure of roofs is necessary. The structure of the roof on a wood frame building is made of trusses or rafters. That’s the skeleton. Over the skeleton is the skin-usually some type of plywood that is 3/4” thick. The waterproofing layer starts on top of the plywood. The first stage in installing the waterproofing layer begins with the skeleton. It has to be strong enough to support the weight of roofing materials and the weight of the green roof materials, plants included. It also has to be able to support any moisture loads and with green roof systems there is always a moisture load. The planting medium, and the water retention mat (if used) will retain water and that is extra weight. So make sure your skeleton will support the load you are planning to put up there. If you are not a structural engineer, then hire one to figure that out for you. Next, you have to be sure the skin of the roof, the plywood, is flat and does not have low spots or bubbles in its surface. Any deformed sheets have to be replaced and you would typically do that when you are reinforcing your roof. Most wood structure roofs will need some reinforcement to make the skeleton strong enough to hold the green roof. The other key consideration is drainage. The excess water that is not retained by the roof has to be drained away so the roof needs to have some kind of slope to it. It doesn’t have to be much, even ¼-inch drop over 10 feet will let water drain. So that again has to be built into the structure, or skeleton. Once the water reaches the edge of the roof it has to have a way to get off the roof. Since the water is draining down to a point where it will be blocked by a parapet you have to plan for drainage holes and for pipe or downspouts to carry the water from the holes to the ground, or to a cistern or sump pit just depending on how you plan to use the water that flows off your roof. Once all of that is in place you can safely add the waterproofing layer. 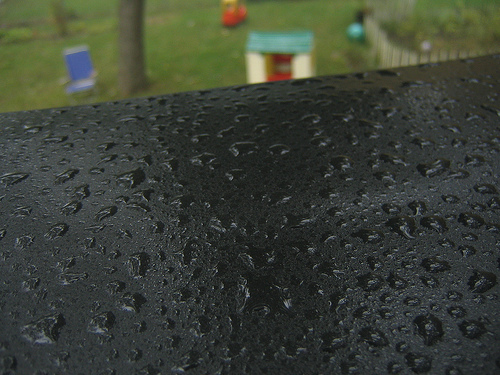 The materials and techniques used for waterproofing are described by the manufacturers. There are many companies that make waterproofing materials for green roofs and you have to follow the instructions each company provides for its own products. There is a partial list of companies included at the end of this article. Some products are sheet goods that you roll out in strips and seal where seams overlap. Other products are liquids that you brush on. Another type of product requires you to use heat to weld the material at seams and any place there is a penetration in it. Every manufacturer will tell you that theirs is the best product for the job. So far I haven’t found any resources that rate the materials based upon user experience. Any reputable manufacturer has had their products certified under various American Society for Testing and Materials (ASTM) and Canadian General Standards Board (CGSB) standards. For example there are standards for flash point, penetration, flow, toughness, water vapor permeability, heat stability and many, many more. So when you are comparing products you should look at their data sheets side-by-side to compare them. And remember, the operative term is “waterproof,” not water repellent or water resistant. Some products will be certified as meeting more standards than others, so that can be a point of differentiation. Above all, the primary two aspects when deciding on your waterproofing layer, beyond the structural integrity of the roof, are the standards the product is certified for, and the installation process. What works is selecting a waterproofing product that has certifications for all the characteristics important for green roofs, and then installing that material exactly as specified by the manufacturer. To save a step get a waterproofing material that is also rated to be root resistant. If you are doing a waterproofing layer yourself, and you have never done one before, then the installation process is going to have to be straight-forward and not require highly specialized or expensive tools and equipment. Ultimately too, you have to factor in price and ease of installation. If the waterproofing membrane requires expensive tools or equipment to install then you may be better off choosing one that only requires common tools and simple techniques. Does that mean you are compromising? Not at all. It just means you’re matching the material to the job and to the skills of the person doing the job. In the end, while you might be a die-hard do-it-yourselfer, if you find yourself having doubts about your ability then this may be one aspect of your green roof that you contract out. Doing that can provide great peace-of mind and reward you with less stress and more time to handle the more enjoyable aspects of installing your green roof. Image courtesy of Flickr user Ctd 2005 under a CC License.